Pandora project focused on developing an educational path for disadvantaged women and sharing best practices in the field of economic integration and female entrepreneurship. Partner organisations aimed to impact on adult education and increase the employability and the entrepreneur spirit of women. Project “Pandora – Discovering European opportunities for Female Entrepreneurship” aimed to develop and share best practices in the field of adult education. The main idea of the project was to develop an educational path for disadvantaged women and share best practices in the field of economic integration and female entrepreneurship. This project aspired at creating a cooperation among partner organisations in order to ameliorate their impact on adult education and increase the employability and the entrepreneur spirit of women thanks to a sharing educational path and to the use of new tools and methods successfully experimented by the other partners. Pandora project included specific learning mobility for the staff and two joint mobility for the target groups and staff in order to work together and make them compare ideas. The project foresaw staff mobility in order to give the chance to four volunteers/social workers/youth workers of each organisation to work with another organization and experience its tool and methodologies. During the mobility experience the person involved was a part of the hosting organization and received a training-on-the-job on the specific tool/instrument and a deeper knowledge of the methodology behind it. 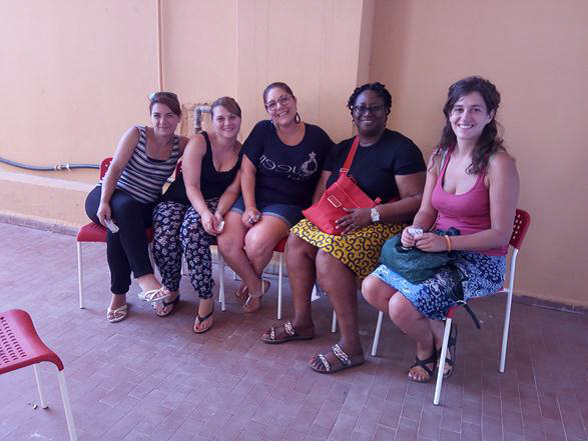 The volunteers/social workers/youth workers who experienced the mobility organized and coordinated the local teaching activity using tools and methodologies such as non-formal education. The main idea of this process was to build capacities and skills, on one hand to form volunteers/social workers/youth workers that operate in the social field targeting women and on the other one to give to disadvantaged women and migrants the opportunity to learn ICT and English basis and specific notions on business administration and female entrepreneurship. This project was delivered between October 2016 and October 2018 and co-funded by European Commission within Erasmus+ Programme.